Bolstered by strong gains in Internet shopping, demand for protective packaging in the US is forecast to expand 4.9% per year to US$6.8 billion in 2019, according to a new report of Freedonia. As consumers purchase more products online, demand will increase for packaging which can protect these goods from shock, vibration, abrasion, and other damaging effects of shipping and handling, such as air pillows and protective mailers. Environmental concerns will bring about a number of changes for protective packaging, primarily for goods delivered directly to consumers. For example, foam loose fill is being supplanted by air pillows and paper fill products in part due to concerns that foam is harmful to the environment, according to the report. “The burgeoning Internet-based grocery and meal-kit delivery market will support gains for products made from environmentally sustainable insulating products, including jute and reusable vacuum insulated panels, as firms look to make their business as environmentally friendly as possible,” noted Freedonia analyst Katie Wieser. Likewise, the desire to reduce packaging weight and bulk has led to the introduction of packaging which is customized to the specific product. Continued growth in manufacturing markets and acceleration in construction spending will also support increases for protective packaging, although gains will moderate from those during the 2009-2014 period, which was positively impacted by recovery from the recent recession, said Freedonia. Additionally, offshoring of durable goods manufacturing continues to present a challenge to local packaging providers. 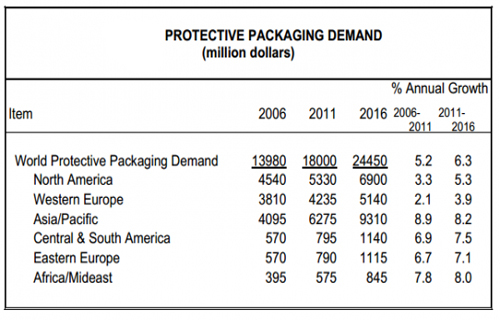 Flexible packaging products, including protective mailers, bubble packaging, air pillows, paper fill products, and dunnage bags, will continue to dominate due to their cost efficiency and their ability to package a wide variety of goods. Foam protective packaging, including insulated shipping containers, molded foams, foam-in-place polyurethane, rolled foam, and loose fill, will comprise the second largest share of total demand, with established applications in manufacturing markets providing growth opportunities despite competition from rigid and flexible materials with more favorable environmental profiles, reported Freedonia. Rigid protective packaging products account for the smallest portion of total demand.&nbsp; However, these products are expected to post healthy gains as molded pulp and paperboard protectors both benefit from a less variable pricing structure and trends toward sustainability.